See that black car? 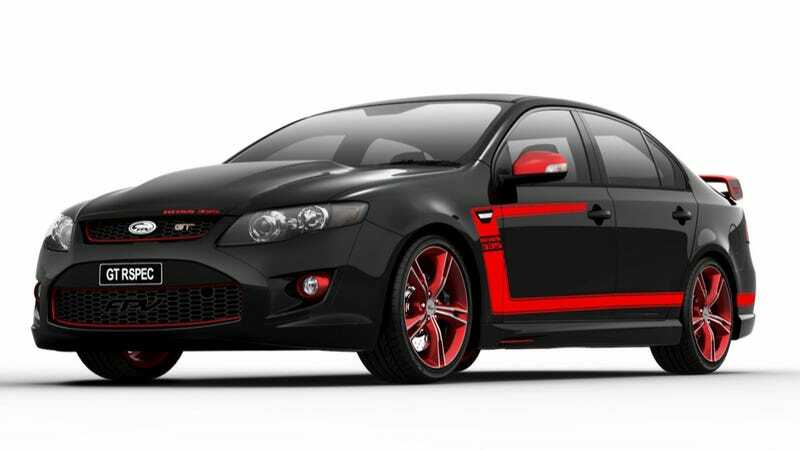 That's a Ford Falcon GT from Ford Australia's FPV performance division. It has four doors, rear-wheel drive, and a supercharged V8 good for 450 horsepower. We do not get it, and after next year, no one will, either. As you've likely heard by now, the Australian Ford is about to die. Not Ford Australia, mind you; the company will survive, but by 2016 they will stop making glorious, V8, rear-drive sedans and utes tailored exclusively for the home market and will instead sell the same Fords that the rest of us get. The first to die, according to an unnamed source who spoke to Australia's The Age, is Ford Performance Vehicles. Ford themselves declined to comment to the newspaper. A refreshed Falcon will be launched in 2014, but the FPV division will be shuttered. FPV has been around since 2002 and currently make four performance-enhanced sedans and one ute. They trace their roots back to 1991 when Tickford teamed up with Aussie Ford to make their cars go faster. There is a bit of good news. The newspaper reports that the company is reviving the Falcon XR8 badge, and that car could carry many of the same components as the Falcon GT, including its motor. And after the Ford Australia lineup goes global in 2016, they will get the Mustang again for the first time in decades, presumably the all-new one planned for 2015. Still, it's a shame to see that FPV, as well as Aussie Ford's Falcons and utes, are really on the way out. Sad day for hoons everywhere.